UK Stampin' Up! 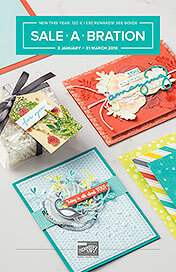 Demonstrator | make beautiful cards | Crafty Hippy: Spring Summer Occasions Catalogue and Sale-A-Bration are now here - HOORAY! 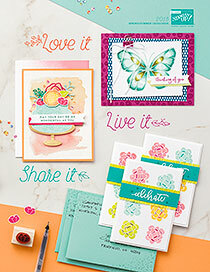 Spring Summer Occasions Catalogue and Sale-A-Bration are now here - HOORAY! So the day has finally come. It's always very exciting when we have a new catalogue out, and this one seems to have whizzed around really quickly. Today is the first day you can order from our new Spring Summer Occasions Catalogue. It's also the first day of Sale-A-Bration. This is our annual giveaway. Between now and the 31st March 2018 for every £45 spent on Stampin' Up! products (excl. P&P) you can choose a Level 1 gift for FREE! This year is a bit different in that we have introduced Level 2 gifts also. You can choose a Level 2 gift for every £90 spent on products. So if you spent £135 you could pick three Level 1 gifts ~ OR ~ one Level 1 gift and one Level 2 gift. Isn't that fab? View the Sale-A-Bration Brochure, and remember that you earn Sale-A-Bration goodies on all products, including discounted items. Use Hostess Code ZW6EWBXK on orders of under £150 for a little something from me. For orders of £150+ (excluding P&P) you'll be able to choose your own Stampin' Rewards at the checkout. On orders of £200 (excl. P&P) you'll get another £20 on top of your 10% back (Stampin' Rewards) to spend on anything you like in our catalogues - plus your FREE Sale-A-Bration items, too! If your wish list is as long as your arm then I really recommend you Join my team of fabulous papercrafters - The Crafty Hippies. The Starter Kit costs £99 to join which includes: £130 of products of your choice, Starter Kit P&P, catalogues, and during Sale-A-Bration you can pick two extra stamp sets of your choice. 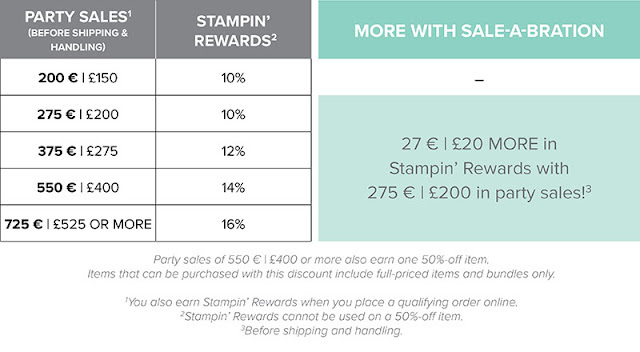 Moving forwards you will receive a discount on Stampin' Up! products, but if it's not for you then you can simply drop with no hassle. This is an AMAZING deal! Over the next few days I'll be posting up projects that have been made with either Sale-A-Bration freebies or with products from the new Spring Summer Occasions Catalogue. If you have any questions please don't hesitate to ask.